Animal Defenders International : Animal rescues : Help get Dominga home! 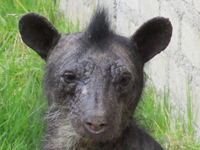 11-year-old spectacled bear Dominga lives all alone in a zoo in Peru. Through the stress of captivity, she has lost almost all of her hair. ADI has been working to move Dominga for over a year, and Peru’s wildlife department have now given us permission to relocate her to the Taricaya Ecological Reserve in the Amazon Cloud Forest. There, we hope she can become friends with our dear Cholita, a fellow bald, spectacled bear, who ADI rescued during Operation Spirit of Freedom. Relocating rescued animals takes a lot of time, money, and resources. ADI’s preparations to move Dominga out of the zoo and into the Peruvian mountains are well underway. The ADI team has built a specially designed travel crate for Dominga, which will transport her on foot, by road, and river, for what we anticipate to be a two-day journey to the ADI sanctuary facilities at Taricaya. The remote location of zoo and sanctuary make this a complex move! As soon as the crate is complete, it will be transported to the zoo and placed in Dominga’s enclosure, so she can familiarise herself with it to help minimise stress on her journey to her new home. An ADI veterinary team will do a full battery of tests on Dominga and trim her overgrown claws at the start of a journey that will take her over the Andes and along the Madre de Dios River to her forever home in the forest. ADI’s target is to have lonely Dominga arrive in her new home next to Cholita on Valentine’s day! You can help make it happen.